The ancient city of Lychnidos / Λύχνιδος (modern Ohrid) on the shores of Lake Ohrid in today’s Republic of Northern Macedonia came to public attention with the spectacular discovery on 30th September 2002 of a golden funerary mask, a golden hand, and numerous other gold, silver, bronze and ceramic artefacts from tomb nr. 132 at the ancient cemetery in the Trebenište area. In fact, the history of the discovery of royal golden masks from the necropolis near the villages of Trebenište and Gorenci (10 miles north of Ohrid) has a long tradition. In this necropolis five funerary masks have been found on three separate occasions over the last century. The first two masks were found by accident in the spring of 1918 by Bulgarian soldiers during the occupation of this part of Macedonia. At the height of the military occupation, excavations were carried out by the Bulgarians which revealed seven royal tombs from which the material was removed from Macedonia and taken to the Archeological Museum in Sofia, Bulgaria, where it is still located today. In 1919, Macedonia was occupied the Kingdom of Serbs, Croats and Slovenians (Kingdom of S.H.S. ), when part of the lake Ohrid shore with 22 Macedonian villages were transferred to Albania. In 1930-1934, Serbian archaeologist H.Vulić revealed six other royal graves in the same cemetery, and discovered 2 further golden masks, all of which were taken to the Serbian National Museum in Belgrade. The exact nature of the culture which produced these spectacular treasures in the 6th / 5th c. BC remains a mystery. The excavations in 2001/2002 revealed a further surprising discovery when a group of burials, dating from the 3rd c. BC, were revealed. These burials provided the first archaeological confirmation in this part of the Balkans of a phenomenon which had hitherto been known only from ancient historical sources. The Celtic burials hitherto discovered at the site consist of one inhumation (No. 143) and 2 cremation burials (Nos. 138 and 58), the best preserved of which was cremation burial No. 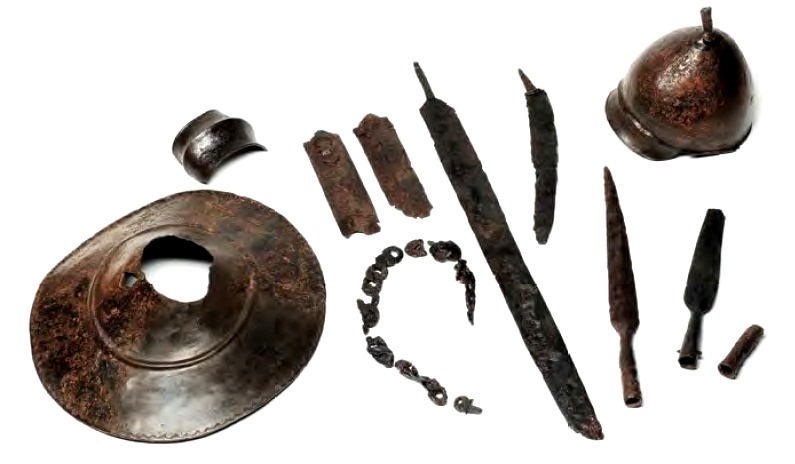 58, which included a Celtic helmet, sword/scabbard, 3 spearheads, an oval shield (boss) a long dagger and a circular shield. 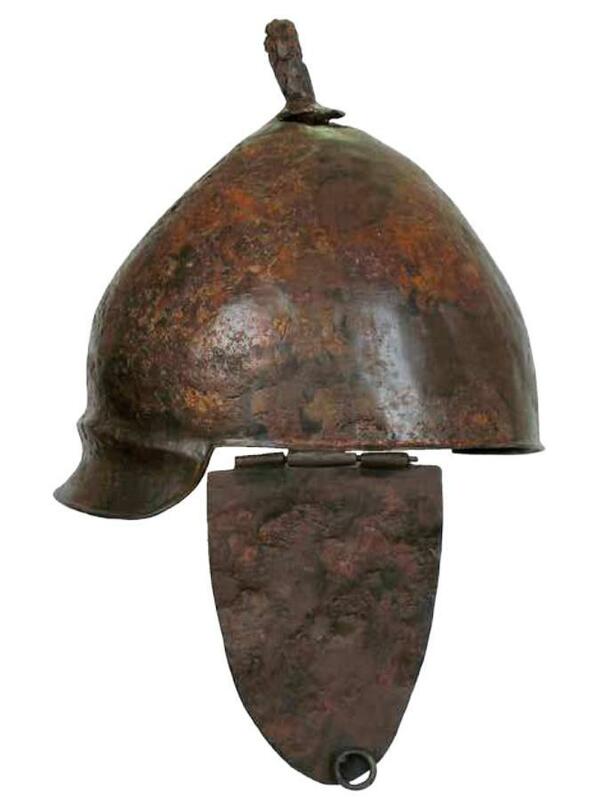 The helmet from the burial is of an early/middle La Têne type, and the weaponry dates the burial in the 3rd – 2nd c. BC. (Guštin M., Kuzman P., Malenko V. (2012) Ein keltischer Krieger in Lychnidos Ohrid, Macedonia. 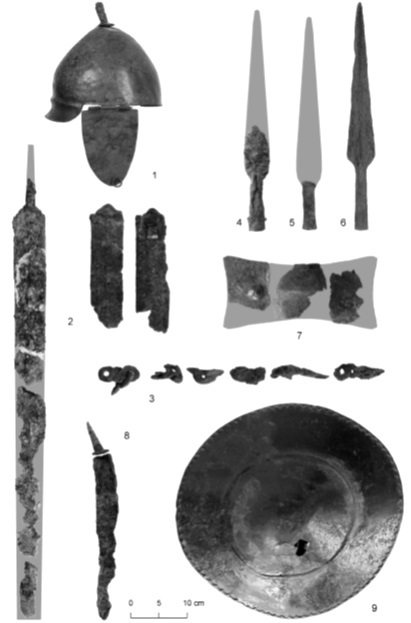 Folis Archaeologica Balkanica, 2012, 2. P. 181 – 196). Burials no. 138 and 143 also yielded Celtic helmets of the eastern type, very similar to those depicted on the relief from Pergamon (loc cit). 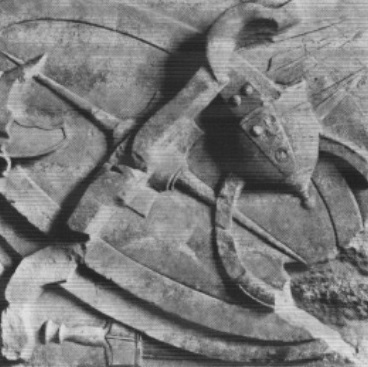 Detail of Celtic weapons, including helmet of the eastern Celtic type similar to those found at Lychnidos, from the relief at the sanctuary of Athena Polias Nikephoros in Pergamon. So what sequence of events brought such ‘barbarian’ warriors to the Hellenistic city of Lychnidos in the 3rd c. BC ? The initial expansion into the Balkans at the end of the 4th / early 3rd c. BC was marked by a brutal clash between the Celtic and Hellenistic worlds, which resulted in the destruction of successive Macedonian armies, and the execution of the Macedonian king Ptolemy Ceraunos. Subsequently, the Celts became an intrinsic part of the geo-political balance of power in the region, and we are told that, “The kings of the east then carried on no wars without a mercenary army of Gauls; nor, if they were driven from their thrones, did they seek protection with any other people than the Gauls’’ (Justinus. Epit. Pomp. Trogus XXV, 2). Celtic warriors quickly became a vital component in the armies of rulers and city states from the Adriatic to the Black Sea, from the Danube to North Africa from the late 4th to the 1st c. BC. In Macedonia itself, Celtic warriors formed substantial parts of the armies in the Macedonian Wars of Succession of the 3rd c. BC to fill the political vacuum which they themselves had created. The warrior burials at Lychnidos provide further valuable archaeological evidence of the aforementioned events and indicate a significant Celtic presence in this part of Macedonia during this period. Furthermore, evidence such as the Macedonian shield in burial no. 58 clearly illustrates that these Celtic warriors held high positions in the city from the 3rd c. BC onwards, becoming an intrinsic part of the military and social structure of the Hellenistic city. The head of a lance, found in 1858 Suszyczno, 30 km from Kovel, Ukraine, dated to the early 3rd century. The Gots are celts ?